Last Tuesday was my husband's grandmother's 90th birthday. How cool is that? You wouldn't know she is 90, she has a more active social life than we do! The family had thrown out ideas of taking a big trip to celebrate, but we couldn't really swing that since we are on a single income and life in Chicago isn't exactly inexpensive. We wanted to do something special in our own way though, and then I remembered seeing this quilt on Flickr a few months ago. Perfect! 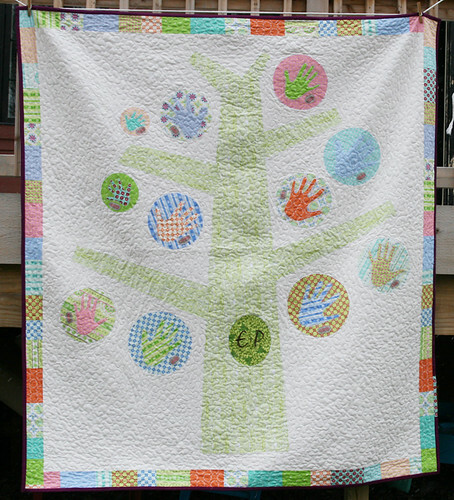 I had a couple concerns...first, we only had 11 people for the tree which is a lot less than the 20+ hands on the inspiration quilt. 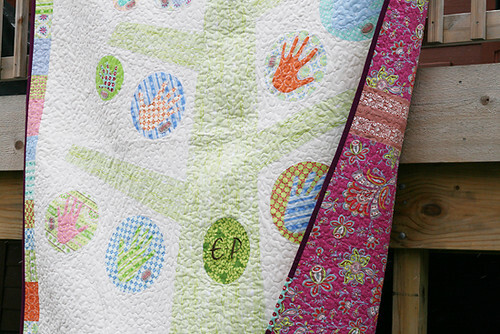 Also, the tree fabric on the inspiration quilt used was perfect, but out of print. (Joel Dewberry's woodgrain in Chocolate). So...my tree ended up being a bit wider and I used the JD woodgrain I could find - light green - instead. 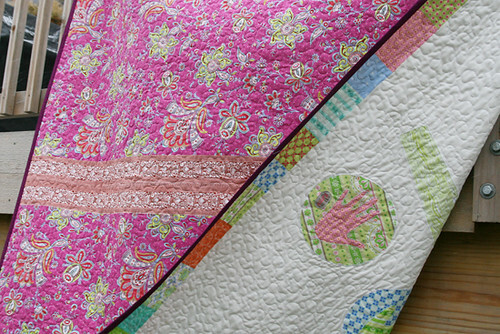 Luckily it matched the Sweet Broderie fabric I used for the hands and border. I never have done applique before. I was a bit nervous, but it turned out great! Sandra has a great tutorial I used on her blog. 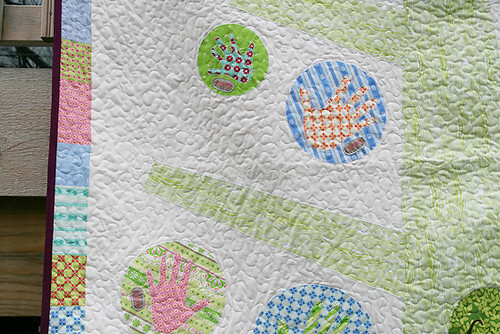 I used my Bernina Embroidery Module to stitch the names for the hands and the initial in the center of the tree. The back of the quilt is a bit wild...but I love it. 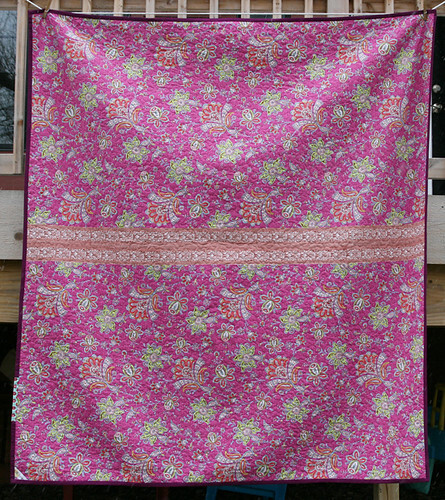 It is from Amy Butler's new Soul Blossoms line of fabric. I quilted this one free motion and it measures about 72" x 86". It's a big boy. LOL Half way through the quilting I started to wonder what I had gotten myself in to.